The Royal Air Force approached North American Aviation to build P-40 Warhawks under license from Curtiss. North American believed they could build a better fighter for the British, and the first NA-73X prototype was flown on 26 October 1940, from Mines Field (now Los Angeles International Airport); the airframe had been completed in a remarkable 102 days! The early machines were afflicted with aerodynamic problems that increased drag and led to fuel starvation. Later redesigns of the radiator and carburetor ram air scoops solved those problems, and the first production model was delivered to the RAF in October 1942. Meanwhile, the Army Air Corps received its first XP-51 on 24 August 1941. However, the Army Air Forces' (AAF) fighter budget outlook was grim, and it looked like the type would be stillborn, so NAA executives and their AAF counterparts conspired to fund the aircraft under the attack budget. Accordingly, bomb racks and dive brakes were added, and the Mustang became the A-36, thus keeping the production line open. On 24 August 1942, 1,200 NA-99 versions were ordered by the AAF, and designated P-51As. The first P-51 A flew on 3 February 1943, and the first deliveries began the following month. Thanks for your views and comments, much appreciated! Great shot of this beauty getting ready to fly! Merry Christmas! Terrific shot...Happy Holidays to you and yours! Great shot to include the prop action. 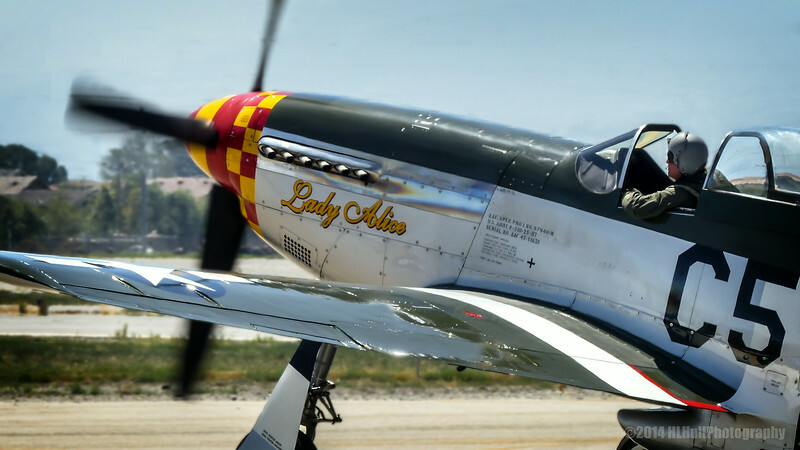 The very familiar nose of the P-51 ! Fine close up ! A Great plane! Very interesting facts.